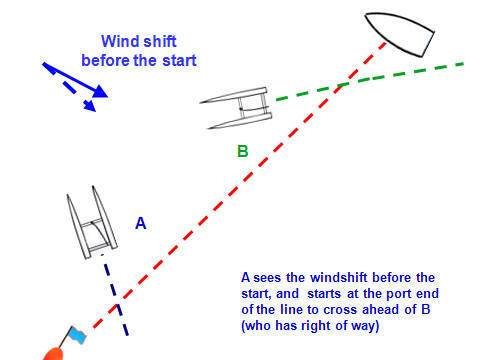 The wind has swung to the left during the start sequence. Stuart (yellow hulls) is the master of picking the port-favoured opportunities, so that part of the usual starting routine for Alastair (blue hulls) in the last 5 minutes is to check out if Stuart has gone down to the port end. This time Alastair has reached down the line from the starboard end as fast as possible, and turned onto port to start with Stuart. In the meantime, the breeze has swung even further left, and the boats on starboard in the distance, way behind, can barely cross the line. 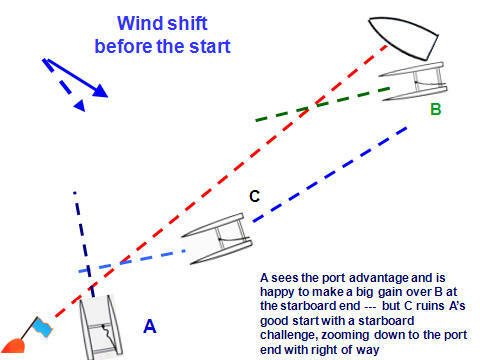 The alternative is starting at the port end but on the starboard tack, which gives right of way over the boats starting on port. This is not easy to get right, as the approach to the line is at a narrow angle, and timing accurately is harder. It can be very satisfying to disrupt the port starters' plans but a worst case scenario is to cause mayhem and then fall below the port mark and have to tack to reach it. 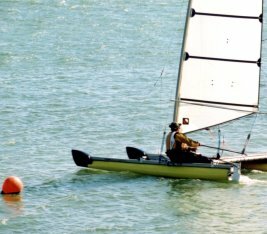 In the meantime the starboard end boats will have caught up from their disadvantaged position and will be coming across with right of way.